BIG is a community for individuals who are involved in science communication. They hold a variety of conferences and workshops throughout the year, including the Little Event. The Little Event is a one day workshop for early career science communicators which I was lucky enough to attend after winning the BIG Little bursary. This included registration for the event, travel expenses, and a years membership to BIG. This year’s event was held at Think Tank, a science centre in the heart of Birmingham. Ashley Kent then described the key factors to consider when organising large events. The afternoon sessions included talks by Brian Mackenwells (Public Engagement Officer, University of Oxford), Toni Hamill (Centre of Life), and Bridget Holligan (Science Oxford). In these talks, we learnt the importance of higher order thinking, and that engagement needs to be Hand-On, Minds-On, and Hearts-On. Lunch time was spent exploring the centre and chatting with the other participants. As well as allowing us to exchange ideas and resources, our varied backgrounds meant we could exchange interesting facts about the exhibits. A private tour of the science garden showed us that science doesn’t have to be an indoor activity. A careers session allowed us chat with the organisers and speakers. I spent most of my time speaking to Lauren Deere (manager of Think Tank) who was able to give me some great advice on how to get a job as a content developer in a science museum (my dream job!). Attending the Little Event was a brilliant opportunity for me to learn the skills needed to become a successful Science Communicator. The chance to meet other early career science communicators has provided me with invaluable advice, contacts, and ideas to help me make the leap into Science Communication when I graduate. It was a wonderful day and I look forward to (hopefully) attending the Big Event in July! The thing that I am most excited about however is my BIG membership, meaning I get free entry into Science Centres across the country! I then helped the group with the final challenge needed to complete their badge – bridge building! Armed with bags of spaghetti and marshmallows and a help sheet from bexscience.co.uk, the Brownies set about building a bridge that could span a 25cm gap. It proved to be quite a tricky challenge as the gap was slightly longer than the length of a piece of spaghetti, meaning that we needed to join two pieces together to get the length. However, I think the hardest thing for some of the girls was resisting eating the building materials! After 40 minutes, we had three bridges waiting to be tested. To test the bridges, a girl from each group donned a hi vis vest and a hard hat (safety first with our budding engineers!). Weights were gently placed on the bridges until they collapsed. One bridge had suffered a collision with a Brownie during construction and so could only hold 200g when tested. The other two bridges managed to hold 800g and 1200g, quite an impressive feat for spaghetti and marshmallow constructions! After a quick clean up, the girls were all awarded their well-deserved Science Investigator badge. To thank me for my help, I was also awarded one which will take pride of place on my lab coat! The girls seemed to really enjoy making (and breaking) their bridges and some of them were really keen to tell me about the vinegar volcano they had made the week before. The Science Investigator badge seems like a really good way to introduce science and engineering to young girls, allowing them to participate in a hands on way that isn’t always possible in a classroom. I was honoured to have been asked to help with this badge and I look forward to any opportunities to help other Brownie units to complete it! 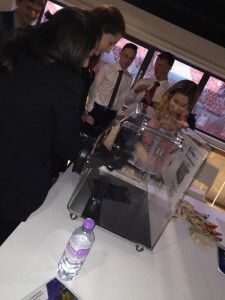 On 16th October, as part of my role as a STEM ambassador with MerseySTEM, I attended the Engineering Your Future event that was held at Liverpool Football Club. After meeting the other ambassadors, we were assigned a group of 25 students. I supervised my group throughout the day as we attended workshops run by different engineering companies. First up for us was Astra Zeneca. After a short talk on biomedical engineering and vaccines, the students were split into teams and challenged to build a balloon powered car. Unfortunately, none in my group managed to get their cars to move more than a couple of centimetres. 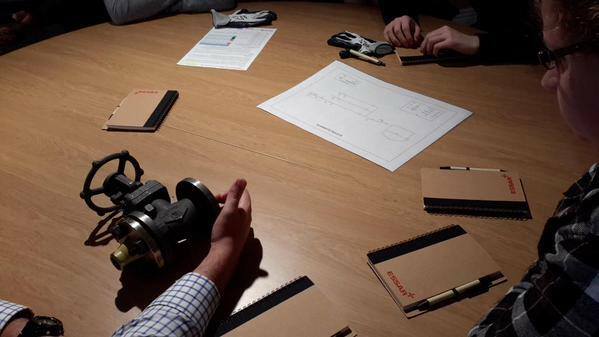 Luckily the group’s morale was unaffected and we cheerily moved on to the next workshop, run by Aecom. Here, we got a talk by two graduate engineers about careers in civil engineering and some local projects that the engineers had worked on. 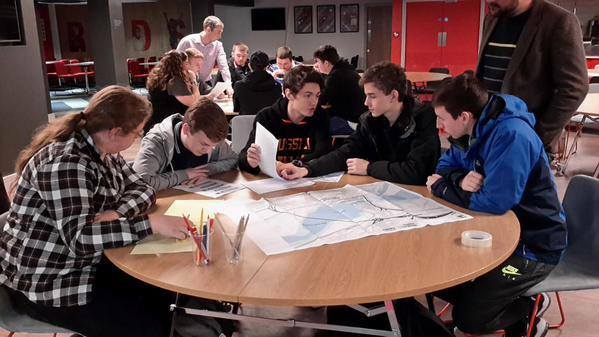 The students were set the challenge of designing a new bridge over the river Mersey – a real project that Aecom is developing. There were a couple of students in my group who were interested in civil engineering and they immersed themselves in the project, carefully considering factors such as materials and locations. Once the bridges were designed, the group moved on to Essar, an oil and gas company. After a short introduction, the students were told about a real oil spillage that occurred at one of Essar’s plants. The students were given example valves from oil containers and each team was assigned an engineer. The teams had to quiz the engineers and identify the cause of the spillage. This gave the students a chance to find out what day to day life is like for an Essar engineer. After lunch, my group were given time to attend the market place. This was a careers fair where companies from all over the country had stalls with information about the work they do. At this point, I was able to explore the fair myself and speak to the engineers manning the stalls. It was really interesting to hear about different types of engineering, some of which I was previously unaware of! After the fair, my group headed over to a talk from ESR Technologies about the role of a safety engineer. By this point, some of the students in my group started to quiz me about my PhD and my route through education. I was able to give them insight into university life and further education options, as well as the career options that come with a degree in Mathematics. The final workshop of the day was from Atkins Global. Three engineers talked about their roles in the nuclear sector and their career paths. The students participated in some games that highlighted nuclear safety issues and the importance of personal protective equipment. Overall, the EYF event was enjoyable and educationally rewarding both for me, and for the students who attended. The Smallpeice Trust is a charitable organisation that promotes science and engineering through the delivery of hands-on workshops and residential courses for secondary school pupils. Over the summer, I volunteered as a supervisor at 4 residential courses run by The Smallpeice Trust. Each course is hosted by a different University and everyone involved stays in the University’s halls of residence. This gives the students a glimpse into life as an undergraduate. During the day, the students participate in practical workshops run by engineers or university lecturers and attend careers talks by sponsoring companies. In the evenings, social activities are planned for the students and on the final evening, there is a formal dinner where the students are encouraged to interact with senior engineers from the sponsoring companies. The first course I attended was in April and was hosted by the University of Durham. This course, ‘Step into STEM’, was designed to give local year 10 students insight into general science and engineering based careers. Over the 3 days, the students had to work in groups of 5 or 6 to complete two workshops, the first of which was run by the National Nuclear Laboratory. The students were challenged to build a centrifuge out of Mechano that could separate out ‘nuclear waste’ (a mix of oil, sand, and water). 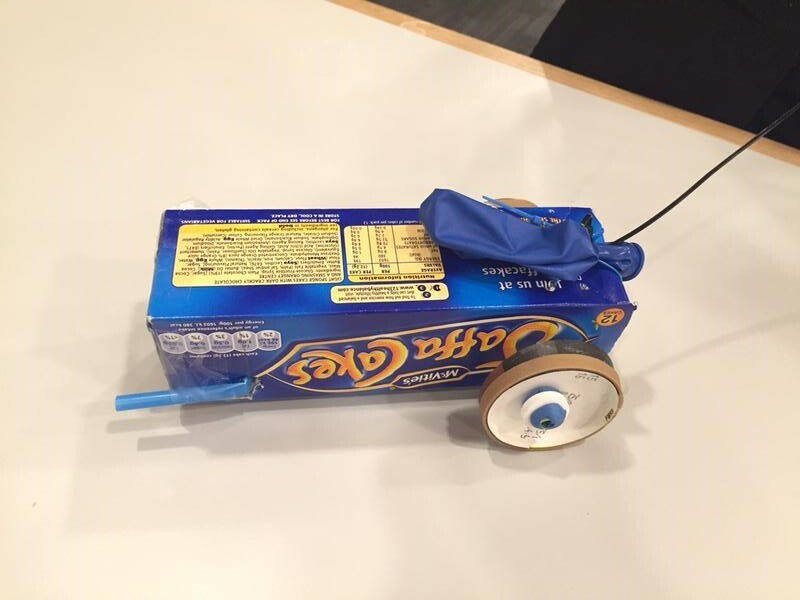 The second workshop was run by Jaguar Land Rover and had the students building a lightweight and durable car out of plastic sheeting, balsa wood, and a 9 volt battery. The second course I attended was ‘Cyber Security with Electronics’ at the University of Portsmouth. This course was aimed at year 9 and 10 students with an interest in computer science and electrical engineering. Two organisations designed and ran the course, GCHQ and QinetiQ. To set the scene, the students were split into groups of 5 or 6 and asked to ‘infiltrate a terrorist ship’. The first challenge was to hack into a cluster of raspberry pis and required some programming knowledge. The second challenge was to use a printed circuit board and soldering to create an alarm that sounds when a light beam is broken. This was much easier for students who had previous experience soldering. Finally, breadboard circuit boards were used to build a robotic buggy that could follow a black line on a white surface. The three very different challenges meant that most students had at least one challenge with which they could fully engage. Third up was ‘Supercomputing in Engineering’ at the University of Southampton. This was the smallest course I attended with only 22 year 12 students split into teams of 3 or 4. As the students were older, the course was run slightly differently with the day activities being run by staff from the University’s Aeronautical Engineering department. Lectures on aeronautical engineering were complimented with workshops that included building computers, modelling aeroplane wings and weather balloon flight paths, and programming and app developing. Finally, I attended a ‘Girls in Engineering’ course at the University of Bristol. This was a heavily subsidised course for girls in year 8 or 9 that aimed to encourage the study of STEM subjects at a higher level. There were 97 participants and 4 outside companies running workshops, Lloyds Registry, Selex, National Nuclear Laboratory, and Babcock. The Lloyds Registry challenge was to build a boat out of wood and an air propeller. Selex challenged the girls to add a series of sensors onto a remote control car. The National Nuclear Laboratory required the students to build a centrifuge that could separate an oil-water-sand mix. And finally, the Babcock challenge was to build a crane out of bamboo and rope. The Smallpeice Trust booked @Bristol for an evening activity, something we all enjoyed! Overall, working as a supervisor was rewarding but tiring work. During the day, a supervisor has the opportunity to engage with the students and the challenges set, but in the evening you are also responsible for making sure that the students get to bed on time.